On December 1, 2018 the New Orleans Academy of Fine Arts celebrated its 40th year. Teachers throughout these years were honored with an extraordinary exhibition of their works. Many of these teachers actually were introduced to the Academy as students and then became teachers. Auseklis was honored and celebrated for 40 years of dedication to classical teaching, and through his personal paintings and his teachings, demonstrations and lectures has kept NOAFA a very unique academy that has produced many extraordinary and successful artists. My mother, Dorothy Coleman, was an angel to Auseklis and the Academy. Together they made quite the team. She was a wonderful artist herself and thrilled every day to watch and encourage faculty and students. It is now my honor and privilege to try and fill her shoes. In these three short months I have learned so much. NOAFA is a true masterpiece. It is my privilege, with my full family support, to lead the school into the next 40 years. My niece, Anna Coleman Dunbar, has volunteered to work with me, to bring her fresh ideas and encourage the next generation to appreciate art from a classical viewpoint. NOAFA just plain feels good. The energy, camaraderie, talent and hard work penetrate throughout the facility. I am personally taking a few classes and must say I am way over my head. I love this school. I understand now why my mother lit up every time anyone asked her about what she did. I am excited to support, to learn, to try and to give NOAFA my energy and love. Come take a class. It could just change your life - it certainly has begun to change mine. 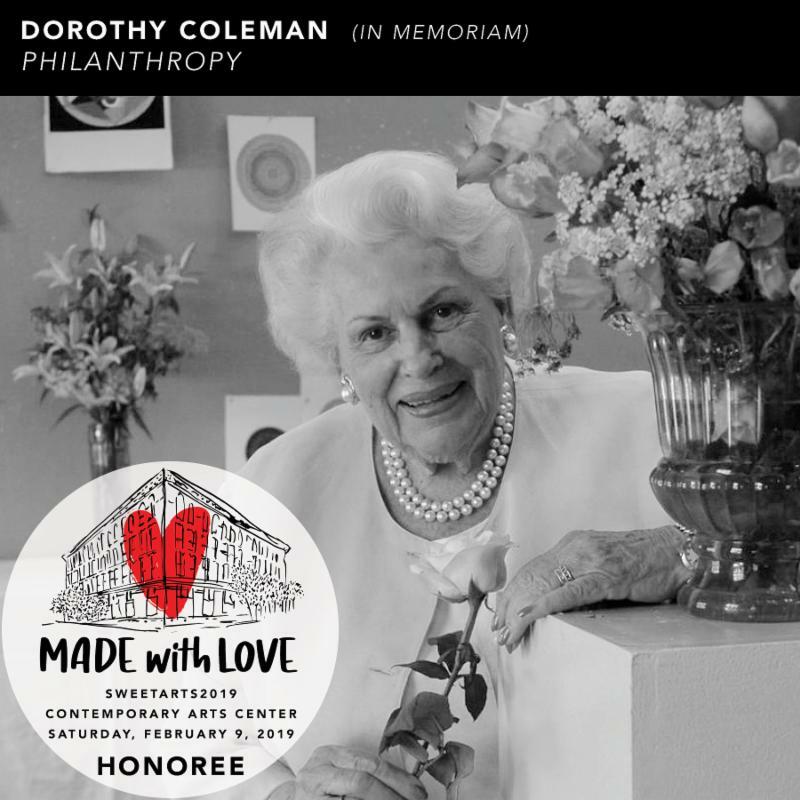 It is with great sadness that we announce the loss of our patron, Dorothy (Dotty) J. Coleman. Dotty devoted her life to the New Orleans Academy of Fine Arts, where she nurtured many students and faculty through the years. While she was able, Dotty was regularly seen cheerfully painting at the Academy. She was a great listener and always interested in learning something new. Dotty was very generous and willing to help those in need. Her spirit has touched the hearts of the faculty, staff and students of NOAFA, as well as the art community in New Orleans and beyond. 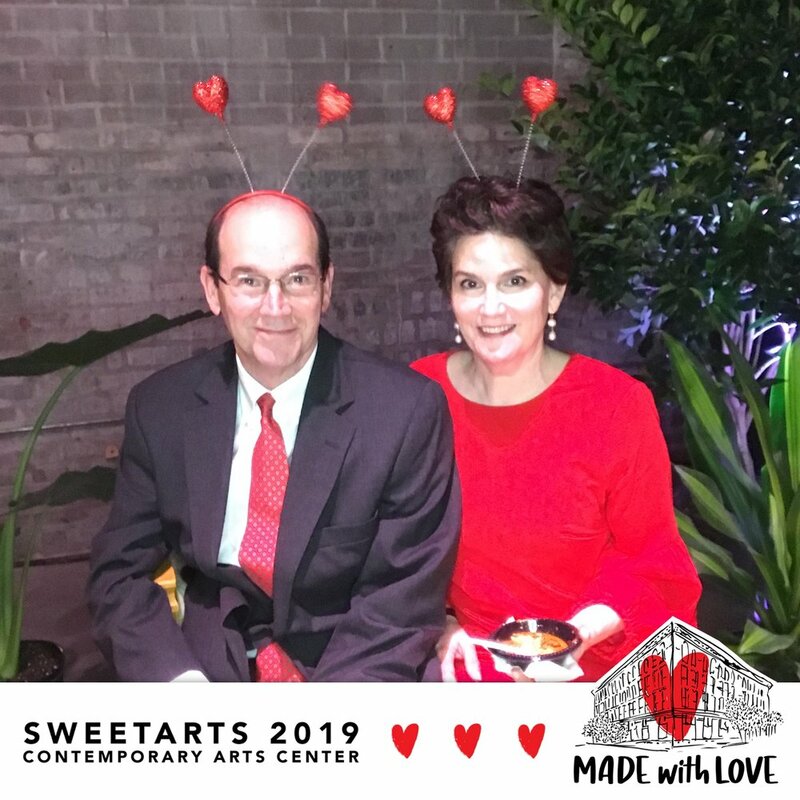 She was recently honored for her philanthropy by the Contemporary Arts Center at the 2019 SweetArts Ball. She was a longtime patron of the arts in New Orleans and served on advisory boards of the Newcomb School of Art, the New Orleans Museum of Art and the Roger Ogden Museum of Southern Art. Our 4oth anniversary gala event on December 1, 2018 and exhibition of past and present faculty was a huge success! Watch the video below and see photos of the event HERE. 2018 marked the 40th anniversary of the New Orleans Academy of Fine Arts. This video celebrates the gala event on December 1, 2018 and the 40th Anniversary Exhibition of Past and Present Faculty. The Academy Gallery is proud to announce Auseklis' next solo exhibition in October 2019 in conjunction with Art for Art's Sake. Patti is currently finishing up calligraphy for a number of Carnival krewes and is working to finish a special violin (hand-painted and hand-lettered, featuring a surprise theme) for the LPO's upcoming Opus Ball auction. Jeffrey will do a public art installation with Paper Monuments at Bayou St John and Toulouse, mid-March through the end of April (click HERE for more information). Kim's life-size bronze sculpture of Brother Martin was unveiled at his namesake high school in January 2019. 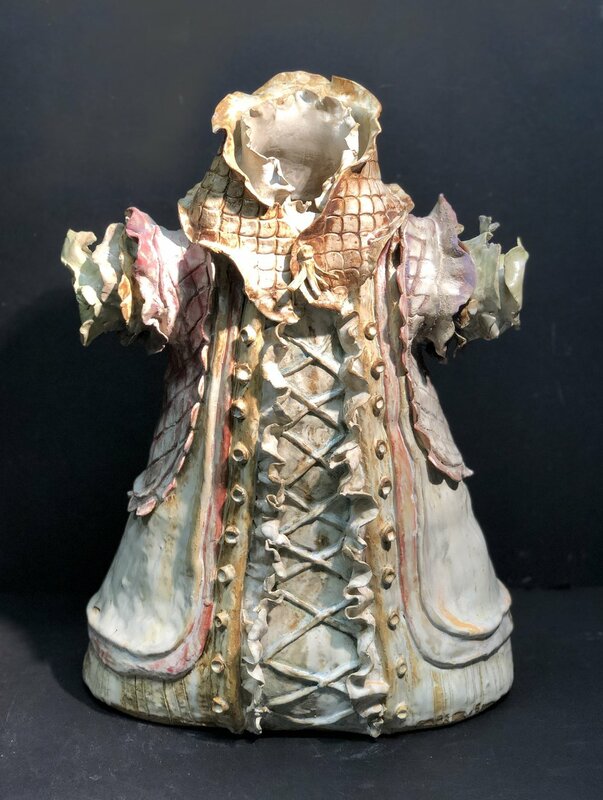 She recently completed a commissioned bust of B. H. Miller, the Police Chief of Gretna, and was selected as the finalist for the Louisiana Percent for Arts & Sculpture Project for the SOWELA School of Nursing in Lake Charles. This summer Gus will be attending the Four Pillars Artist Residency in Mount Gretna, PA, where he will live and work in an artist cottage and studio with other selected artists. This period of intense focus on his art will culminate with local and regional shows organized by the program. Diego's next solo exhibition will be at the Academy Gallery in October 2019 in conjunction with Art for Art's Sake. Kaori practices urban landscape painting at the Salon Artist Residency at Canal Place, presented by the Arts Council New Orleans. Open studio hours are Saturdays noon to 4pm, and the residency continues until mid-April. Carol's work will appear in several publications this year, including a feature article in the magazine "Pastel Journal" in April, and some of her drawings will be included in the 2019 edition of "Strokes of Genius 11". We are very excited to be showing her New Orleans area church interior drawings at the Academy Gallery in November (see "Coming Soon to the Academy Gallery" for more information). Check out Phil's tent at the Palmer Park Art Market on the last Saturday of every month, where he sells his class demonstrations and quick sketches for affordable prices. Aimée currently has an installation of her work at the CAC (official opening March 14), and will have a solo show at Jonathan Ferrara Gallery, opening on April 6. She will be a part of a two-person show at Spalding Nix Fine Art Gallery in Atlanta. Zona was the cover artist in the December '18/January '19 issue of Inside New Orleans magazine. Click HERE to see her painting on the front page, and go to page 16 for the insightful article about her and her work. Several of our Faculty Members will participate in Shadows on the Teche Plein Air, an annual week-long plein air event in New Iberia March 9 - 15, and the annual Abita Plein Air event April 26 - 28. Kate was a student at NOAFA 1993 - 96 and joined our faculty in 1999. She left in 2004 to pursue her BFA at the Pennsylvania Academy of Fine Arts, upon which NOAFA is modeled. Kate is an accomplished artist and illustrator, whose work is in numerous public and private collections, and whose illustrations are published in several books. 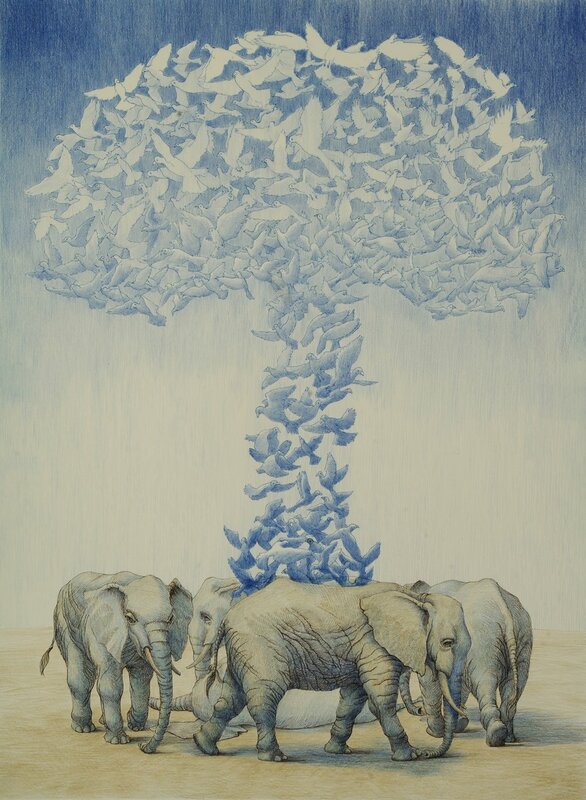 Le Mieux Galleries recently showed her "Antidote Series" of mixed media work on paper about which she says: "I've rediscovered the value of escaping into the world of imagination, dominated by animals engaged in human activity and sharing human emotions. They represent us at our best, finding pleasure in small things and connecting in joy and grief." See some of Kate's original work at LeMieux Galleries on Julia Street, look for her illustrations in Why Fish Don't Exist, a non-fiiction book for adults to be published in the spring 2020, and study with her in one of her workshops in Europe. We are so proud to count Kate among our alumni and former faculty! Sandra is Dotty Coleman's niece. She has been working at the Academy on and off for 36 years, and has been our General Manager since 2013. Sandra paints in oil, watercolor and gouache, and participates annually in our Miniature Show. Nikki earned a BFA and spent years in advertising, poster design and television production. In 1989 she decided to pursue art and registered at the New Orleans Academy of Fine Arts, where she studied under Auseklis Ozols, Dell Weller, Kathy Gergo and many other fine instructors. She has spent 30 years at NOAFA: working in the office, teaching Color & Design (15 years) and being a student always. Kris started her art education at NOAFA in 2006 and has been working here since 2008. "Almost three years ago I abandoned my regular life and the comforts of civilization for over 6 months to walk the Appalachian Trail from Georgia to Maine. During that journey the few fellow wanderers who knew what I do in my other life would sometimes ask: "How do you imagine this journey will influence your artwork?" I didn't have an answer beyond the knowledge that it would. I couldn't have known then that there wouldn't be beloved mountains or streams or trees in my paintings as a result, and that the influence would be about feelings more than anything else. While on that 2200-mile walk I would frequently sit on mountaintops after pulling myself and 20-30lbs of necessary belongings up the difficult wild trails, no energy left to keep up my barriers, and I would look out: heart cracked open, feeling at one with those mountains, the chipmunk scurrying by, the rhododendron bush beside me, feeling no more nor less important than any of them, my heart filled with tenderness towards and connection to them. The heaviness of life, its often overwhelmingly heavy burden, falls away in those kinds of moments. What is left is gratitude, lightness and tenderness; a tenderness that can bridge divisions between us and our environment, between each other. This series of paintings is an expression of these feelings." 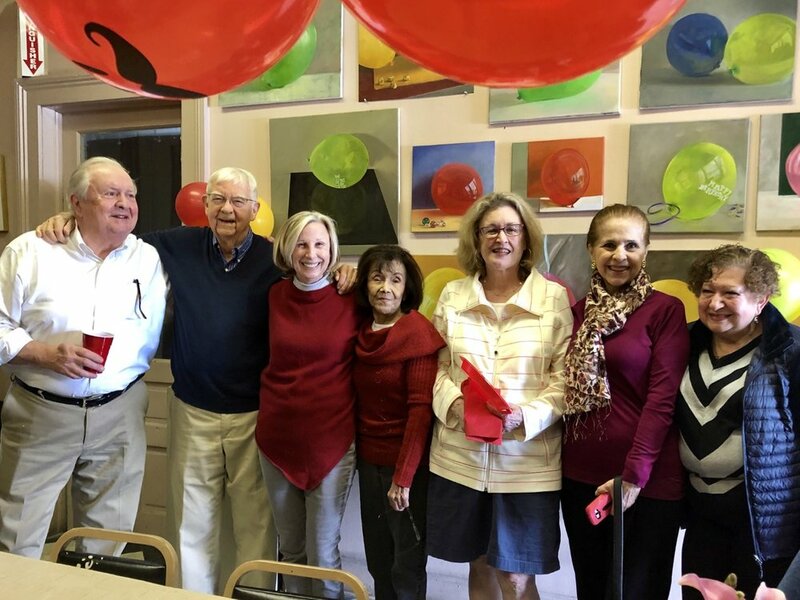 Auseklis' advanced still life students painted balloons as a challenging class assignment just in time for us to display them for our Valentine's Day luncheon. 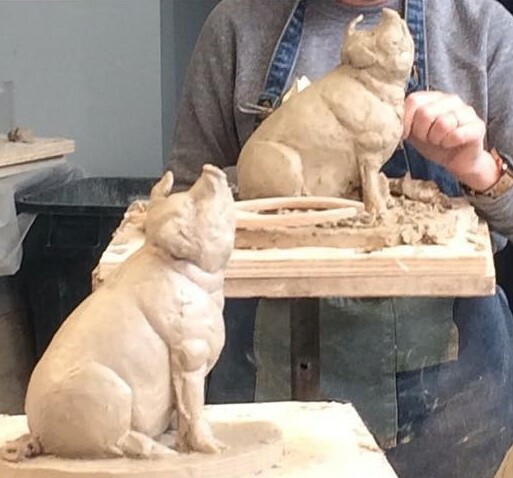 Kim's Animal Sculpture class learned to sculpt pigs this semester, and Madame Grima, newly returned from her residency in Paris, made a surprise visit on February 6. Signed copies of John Kemp's book about New Orleans Academy of Fine Arts Founder and Director Auseklis Ozols are currently available for purchase at our office.